Beautiful summer berry salad. Creamy poached salmon served with tart raspberries, peppery rocket, and a zingy dressing of tarragon, ginger, lime and chilli. Cooking over direct heat, such as grilling or frying, exposes the surface area to aggressive heat. This creates a tasty browned crust from the caramelised meat sugars, but can also result in over-cooking and a tough, dry interior. Poaching cooks the food evenly throughout, ensuring that the interior stays nice and moist. Because the meat is not browned, the flavour is more subtle – some would say bland. For this reason, the poaching liquid should contain plenty of aromatics, and the food should be served with strong flavours. 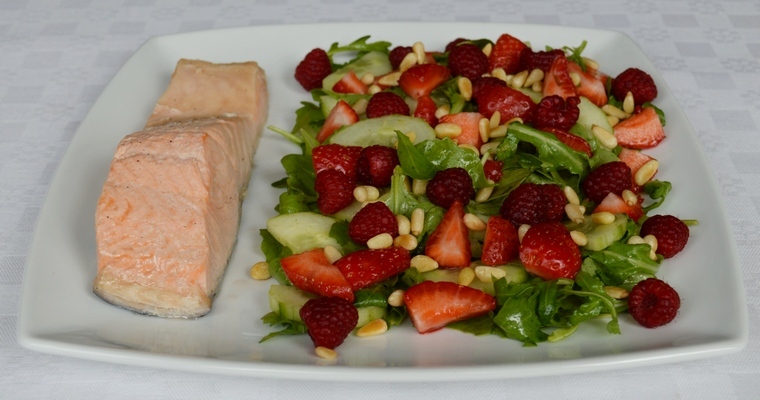 I love the interplay of aniseed tarragon, tart raspberries and creamy salmon in this recipe. Poach the salmon. Put all the poaching ingredients except for the salmon in a saucepan (carrot, shallot, celery, white wine vinegar, tarragon, salt and pepper). Add enough cold water so that the salmon fillets will be covered by about an inch when added. Cover with a lid and bring to the boil. Reduce the heat and leave to simmer gently for 5 minutes. Lower in the fish, and then replace the lid. Simmer for 8-10 minutes, until cooked. Carefully remove the fish using a fish slice, being careful not to break up the flesh. Leave to cool on a plate for a few minutes. If you like, you can gently peel off the skin (although it contains a lot of nutrients, so is worth eating!). Reserve the poaching liquid for making stock. Toast the pine nuts. Heat a dry frying pan over a medium heat. Add the pine nuts and lightly toast until brown in patches – about 3 minutes. Set aside. Assemble the salad. Combine all the dressing ingredients in a jam jar, and shake vigorously until blended. Just before serving, pour half of the dressing over the rocket leaves and cucumber, and toss until evenly coated using your hands. Carefully transfer the poached salmon to a serving plate using a fish slice. Add the rocket leaves and cucumber, then top with the strawberries, raspberries and pine nuts. Drizzle over the remaining dressing.